Southlake Carroll Dragons for Hope – Happy Birthday Jojo! Jojo recently had the most awesome birthday weekend – EVER. Jojos 6th birthday weekend higlights! This past year has come with the blessings of amazing people and amazing hearts and our Southlake Carroll Dragon Football team has been one of our favorites. 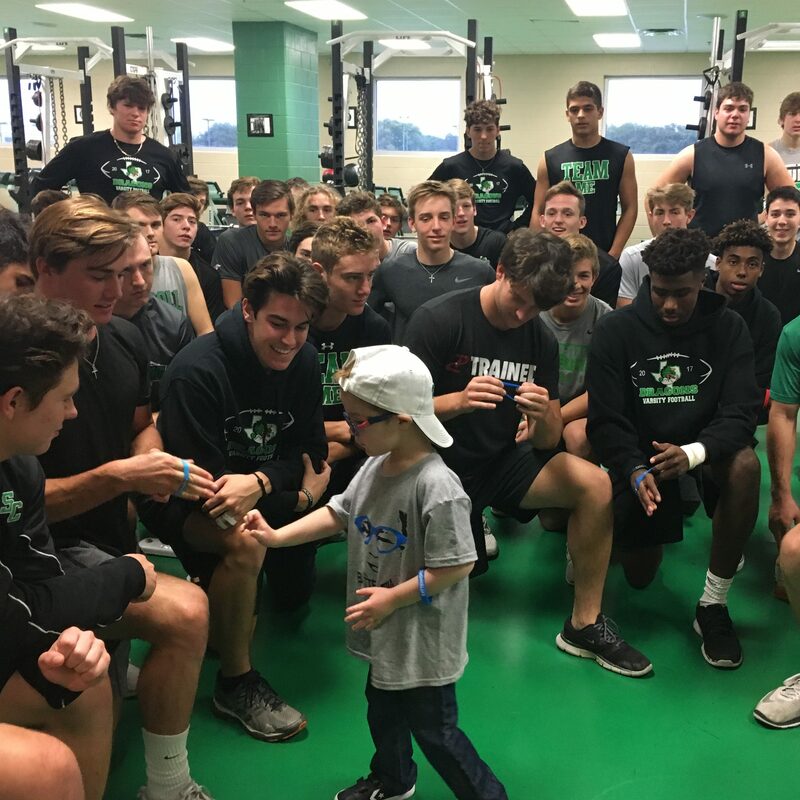 Last year, Jojo and our family got to spend time with the players sharing his Batten Hope bracelets and making some great memories on the practice field – Jackson Kimble and the varsity team showed us exactly how much heart it takes to play great football. 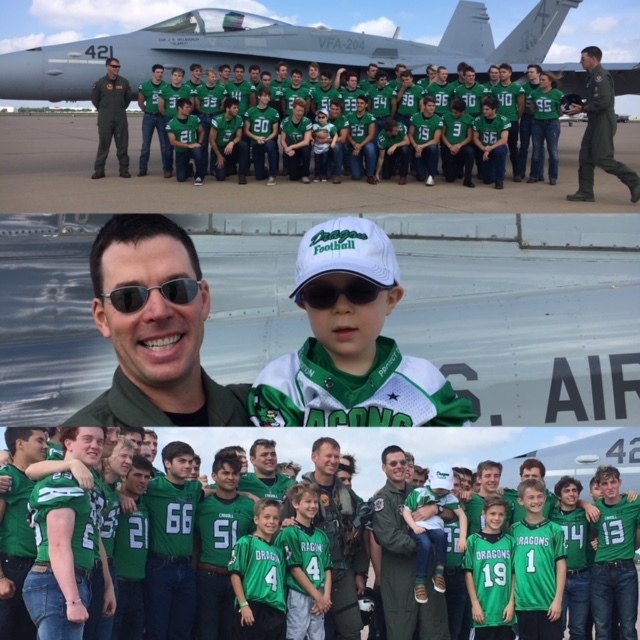 This past weekend, Jojo got to celebrate turning six with some amazing new buddies – the 2018/19 Dragon varsity football team, Commander Rob Roy and Colonel Gavin Tade. The guys and gals from this team made the day. Since Jojo has become mostly blind over the past year, he probably didn’t realize he was sitting on a jet when Colonel Tade lifted him on to the wing for a photo, but his sweet smile when that jet flew overhead told us he though it was a pretty cool experience. You can’t beat the breaking rumble and roar of an F-18 when your’e six! Colonel Gavin Tade and Jojo. And an F-18 – awesome. 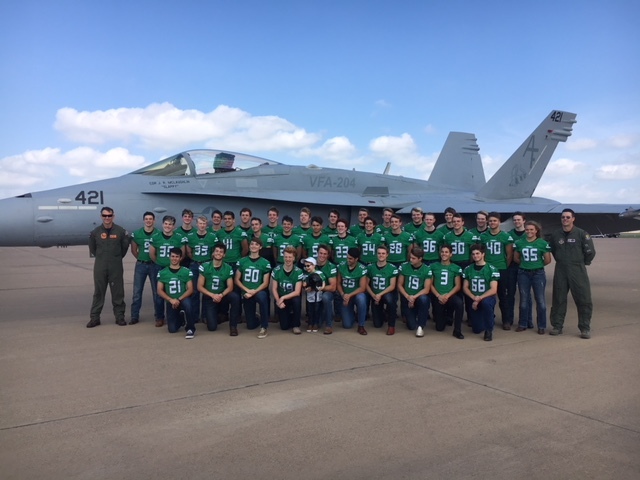 Thanks to the Southlake Dragon Football team, to Commander Roy and to Colonel Tade for showing Jojo a great day, and for showing all of us just how big a Dragon’s heart can be! You are truly AWESOME! For Jojo’s birthday month, we are working to raise $60,000 to help fund the safety study for the clinical trial that Batten Hope is working to fund – please help us raise one candle for each of his years so far! So far we have 2 candles and 4 to go! We need your help!